GitHub - google/ios-webkit-debug-proxy: A DevTools proxy (Chrome Remote Debugging Protocol) for iOS devices (Safari Remote Web Inspector). A DevTools proxy (Chrome Remote Debugging Protocol) for iOS devices (Safari Remote Web Inspector). Want to be notified of new releases in google/ios-webkit-debug-proxy? The ios_webkit_debug_proxy (aka iwdp) proxies requests from usbmuxd daemon over a websocket connection, allowing developers to send commands to MobileSafari and UIWebViews on real and simulated iOS devices. iOS WebKit Debug Proxy works on Linux, MacOS & Windows. On Linux, you must run the usbmuxd daemon. The above install adds a /lib/udev rule to start the daemon whenever a device is attached. Ctrl-C to quit. Also, the proxy can be left running as a background process. ios_webkit_debug_proxy can be used with many tools such as Chrome DevTools and Safari Web Inspector. To use Chrome DevTools it's the recommendation to use the RemoteDebug/remotedebug-ios-webkit-adapter project, which has instructions on how to setup Chrome to remote debug iOS devices, much similar to Android debugging. The reason is that recent versions of Chrome and Safari there're major discrepancies between Chrome Remote Debugging Protocol and Apple's Remote Web Inspector service, which means that newer versions of Chrome DevTools aren't compatible with Safari. You can use Safari Web Inspector extracted from Webkit sources, e.g. artygus/webkit-webinspector. Another option is mozilla/valence which enables Firefox DevTools to be used with iOS. Navigate to localhost:9221. You'll see a listing of all connected devices. Click through to view tabs available on each, and click through again to open the DevTools for a tab. If you use -f chrome-devtools://devtools/bundled/inspector.html, you won't be able to click the links shown in localhost:9222 as Chrome blocks clicking these URLs. However, you can copy/paste them into the address bar. Just the same, you can apply the appropriate port (9222) and page (2) values below. The -f value must end in ".html". Due to security reasons, https URLs will not work; use http or force-allow with the URL bar's shield icon. As of Chrome 45, the primary URL changed from devtools.html to inspector.html. To disable the frontend proxy, use the --no-frontend argument. If a port is in use then the next available port will be used, up to the range limit. Run this before make: ./configure LIBS="-lm"
The idevice_id executable may be found as part of the libimobiledevice-utils package. 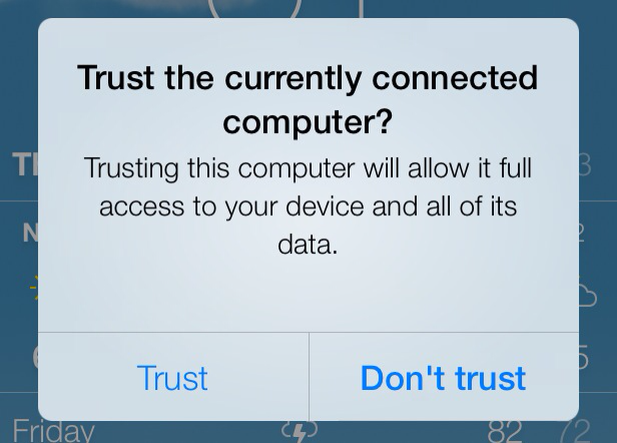 Check the device for a prompt to trust the connected computer. Choose "Trust" and try again. Could not connect to lockdownd, error code -<number>. Exiting. Lastly, always try replugging in the USB cable. JSON-formatted APIs are provided for programmatic clients. ws://localhost:9222/devtools/page/1 to inspect a tab. See the examples/README for example clients: NodeJS, C, clientside JS, websocket and more. View the design document for an overview of the source layout and architecture.